From March to October Berlin Bike Tours depart daily at 11.00 and daily at 10.00 from the last weekend in March to October. An addition tour at 15.30 operated on Mondays, Wednesdays, Fridays, and Saturdays from May to September. 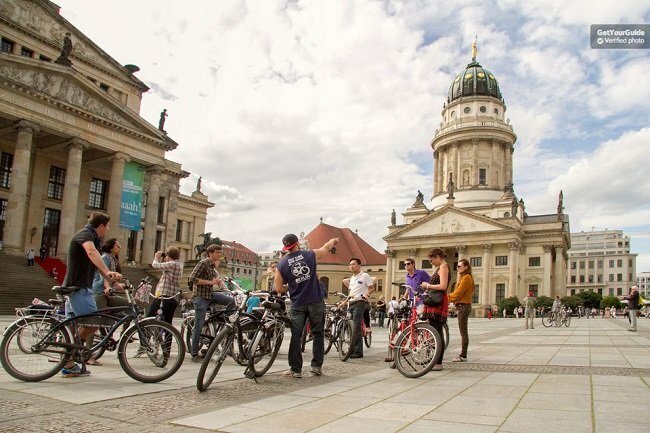 Berlin Bike Tours depart only at 11.00 Mondays, Wednesdays and Saturdays from November to February. For an afternoon tour visit between May and September. We are comparing Berlin Bike Tour Prices from leading ticket suppliers and Try to find you Cheap tickets prices on the market. Meet your friendly English speaking guide under the great ‘Toothpick' TV Tower on Alexander Platz, after a brief introduction and orientation you'll hop onto your very own bicycle and start exploring Berlin City Centre like a local. There is simply no better way to see this metropolitan city, by bike you'll cover far more ground than you could on a walking tour and reach those hidden nooks and crannies that can't be found on a bus tour. Your guide will take you through the events of 20th century Germany, including the muddy waters of WWII, the Cold War, the Kingdom of Prussia and post-communist Germany. Learn about Berlin's unsettling past and hear how this modern city pulled itself from the ashes to become one of Europe's most diverse and forward-thinking city's. Your Berlin bike tour will be conducted at a leisurely pace so you will have plenty of opportunities to contemplate the city's many monuments, ask questions, and pose for pictures. During this 4-hour tour you will visit the new Government Quarter, pass beneath the Brandenburg Gate, cross the east-west border via the notorious Checkpoint Charlie, and ride across Berlin's largest city park, the Tiergarten, where you might like to take a break and sample a local beverage in Berlin's Beer Garden. Berlin Bike Tours are suitable for all ages and all fitness levels, so families with children or mature visitors can enjoy the tour. The tour covers approximately 6 miles/10 km, at a relaxed pace with frequent stops, so, as long as you can ride a bike this is the tour for you. This tour is also great for visitors who have limited time in the city, you will cover a large amount of history and famous landmarks in just 4 hours. Your Experience With Berlin Bike Tour? Whizz though Central Berlin seeing many of the city's most significant landmarks, monuments, and famous attractions on a compact 4 hour guided bike tour. Learn a lot of Berlin's long and complicated history from a professional local guide. Enjoy the benefits of a sociable small group cycling tour. Stop to visit the Brandenburg Gate, the Gestapo Headquarters, Checkpoint Charlie, the TV Tower, Hitlers Bunker, the Berlin Wall Memorial and much more. Discover Berlin's ‘Green' area on a detour through the Tiergarten and visit to Berlin's Beer Garden. What Berlin Bike Tour Includes? Use of well maintained bicycle and helmet. 4.5 hour guided city tour. The company also offer bike rental, so, if you enjoyed the Berlin Bike tour and want to see more of the city on two wheels then this might be a good option for you. Travelers Reviews about Berlin Bike Tour? The Berlin Bike Tour has a 5-star rating on TripAdvisor which is partnered and shared reviews with Viator. On Get Your Guide the bike tour has a 4.8 out of 5-star rating. Without a doubt this is one of the top things to do in Berlin. Travellers say that this was an excellent, fun and enjoyable tour. Although reviews are mostly positive, comments point out that there is not much time in each place and you may need to come back after to take your photos. You will need to show your guide your e-ticket or printed ticket. Most tickets are refundable however no refund will be issued if a cancellation made less than 24 hours in advance. Charges will apply to tickets purchased from Viator for any cancellations made less than 7 days in advance. Please wear comfortable clothing and footwear for cycling and come prepared for the weather, Berlin Bike Tours operate on wet days and will only be cancelled for severe weather conditions. Gloves and rain ponchos are available at the bike pick-up shop. Meeting Point: Under the TV Tower on Alexander Platz, Berlin.